It’s been a long, hot week. Temperatures have been in the upper 90’s and today we hit 101 (38°C). We’ve had a few delays with the roof, but it should finally be finished in two more days. 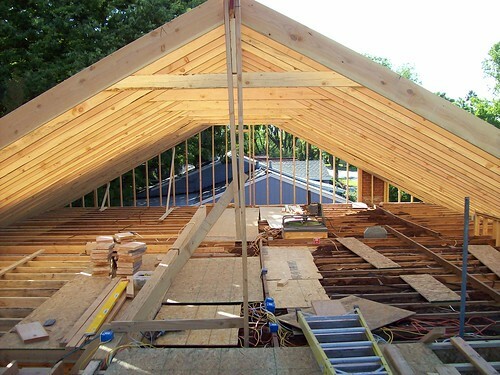 Our general contractor convinced us to change our plans from a truss roof to “stick framed”, and we’re very glad we listened to him! This saved us a few thousand dollars (mostly on the foundation), and we got a *huge* attic–about 60 feet by 10 feet, if we want the minimum height to be 6 feet. This past week we also got the power and telephone lines buried. The power line had been resting on the roof of the quilt shop, so we were finally able to sheath the quilt shop roof last weekend. Lots more pictures are available in the [Remodel Week #9 photoset](http://www.flickr.com/photos/sonicchicken/sets/72157600352096063/) on Flickr. Things are going to get **really** busy now! 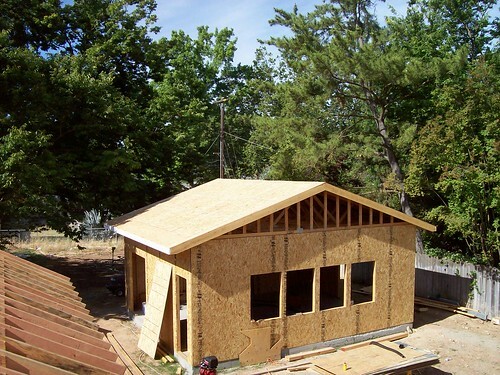 This coming weekend we will probably be sheathing the roof of the main house, which has about 6-7 times the area of the quilt shop. It also has four valleys, whereas the quilt shop was a simple gable roof. On the other hand, we’re going to be laying down a *lot* more full sheets of OSB than we did on the quilt shop. If we can get some extra help, we should be able to get this done over Father’s Day weekend. The following weekend (June 23-24) is our second demolition party, if all goes according to plan. More to follow, so check back often! Well, more delays. 🙁 The framing crew probably won’t be done until *this* Friday, 6/22. 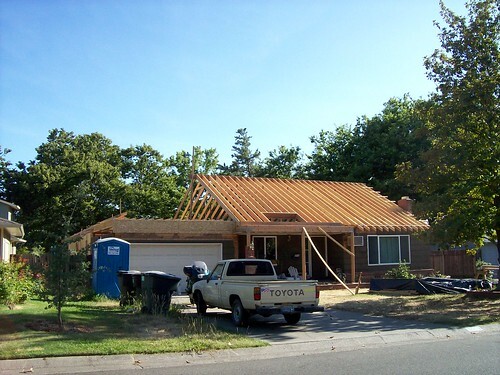 So the roof sheathing should happen this weekend, 6/23-24. The good news is the weather forecast is *much* nicer this coming weekend: highs in the mid-80’s! And our second demolition party is now tentatively scheduled for June 30. Pingback: SonicChicken weblog » Blog Archive » Busy, busy, busy!